Okay, I’m back with the review of the Impel Trading Cards and to make up for lost time, we’ll tackle 3 cards today. 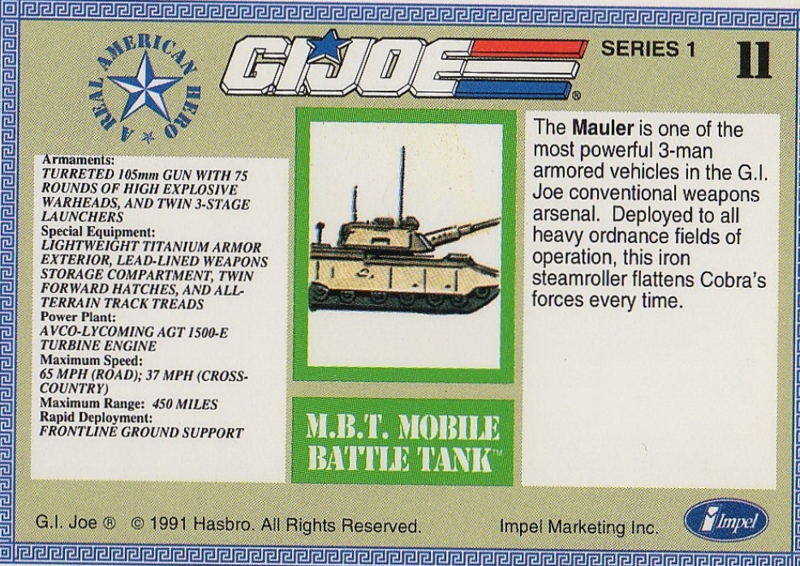 First up is the #11, the Mauler M.B.T. 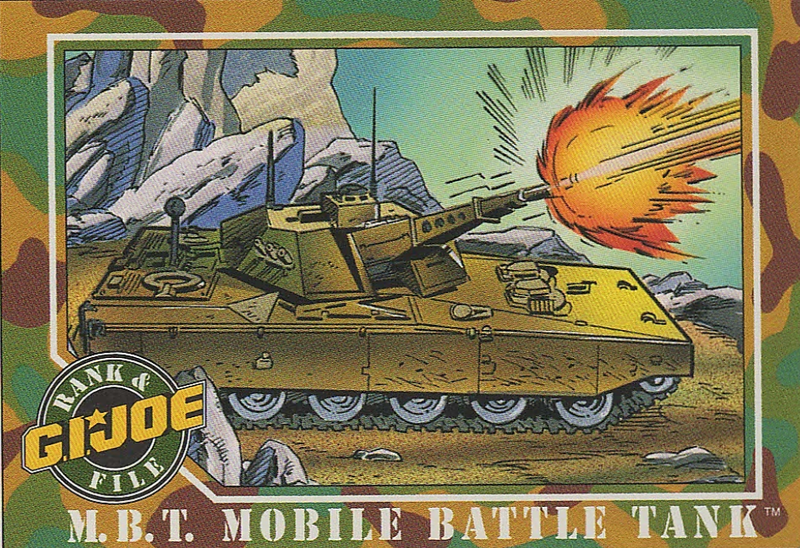 (Mobile Battle Tank). This is one of the more realistic looking toys that were more common in the early years of the 3.75 inch run. I didn’t own this tank when I was a kid. It was released in 1985 and I don’t think it made the trip over the Atlantic to be sold in stores here. Fact is, I still don’t have this one in my collection. I do have the 2003 Patriot Grizzly Tank, which can be seen as the M.B.T.’s successor. 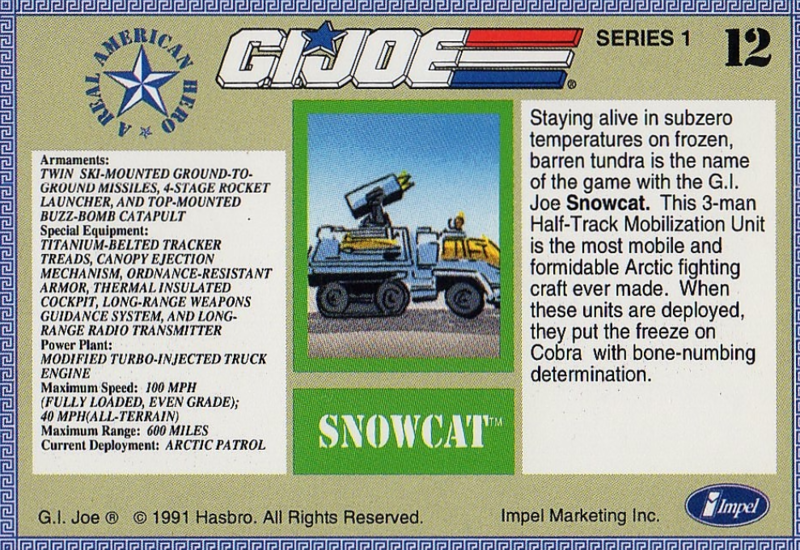 Next we have card #12, the Snowcat. Now this is something else. The Snowcat (or is it Snow Cat?) 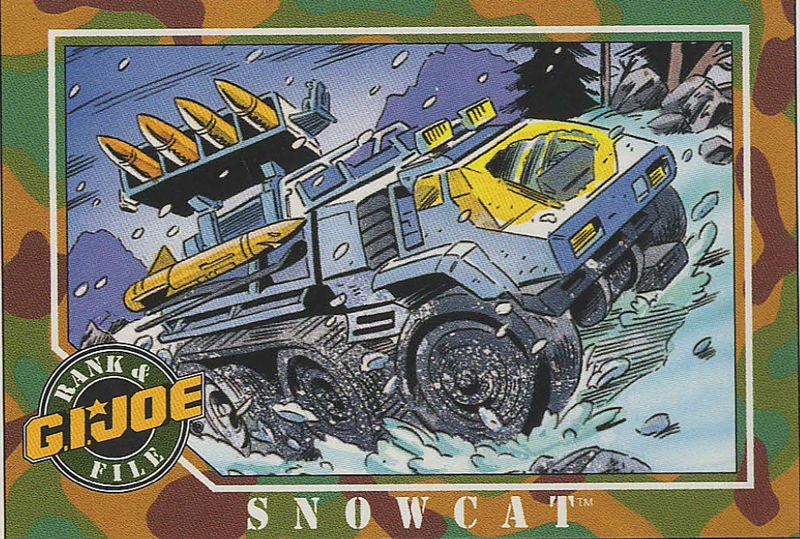 did make it’s way into Europe, but as the Tiger Cat, part of the 1988 Tiger Force. I had this in the tiger striped version and later on during my collecting, also acquired the original white version. Come to think of it, I also had the Tiger Force Blizzard figure and never really knew there was a white version of this until I started life as an adult collector. One does wonder how on earth you’re going to camouflage yourself (or your snow vehicle) when it’s bright yellow with orange and black detailing. Then again, maybe the Cobra Soldiers were all colorblind. 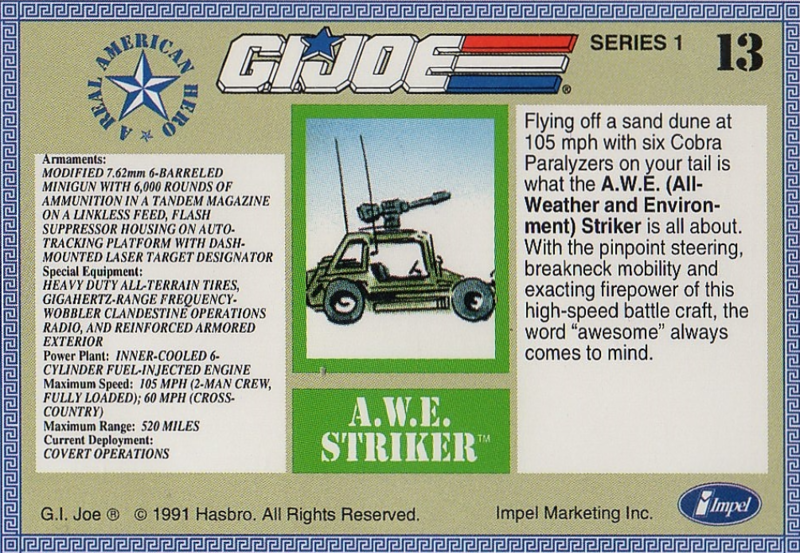 The last one for today is the #13 card, the A.W.E. Striker. 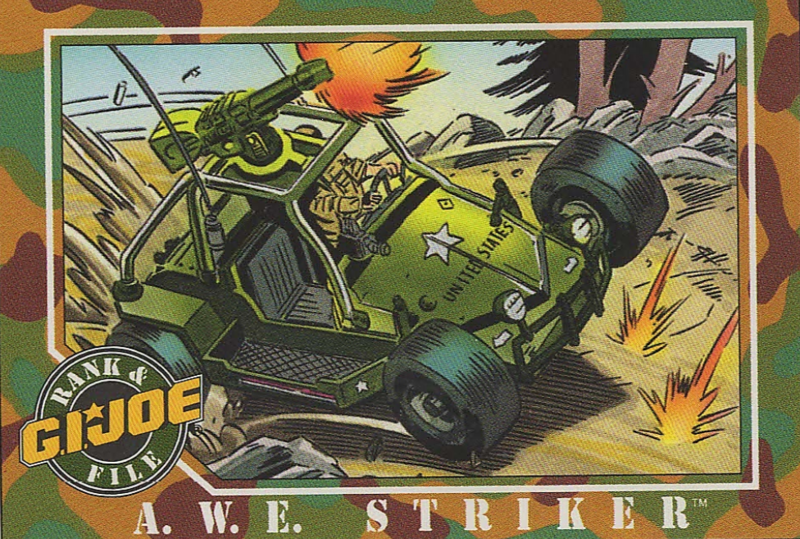 There are like 9 gazillion versions of this vehicle released (okay, so maybe more like 10, but still) and I’m a bit sad to say that the only one I have in my collection is the 2012 Ninja Commando version. The vehicle doesn’t really stand out for me. I do like the fact that the top mounted cannon can be remote controlled (as seen in the comics). I can see this working as a fast response vehicle, but other than that, there’s no real protection , heck there even aren’t any doors. Happy Collecting & Yo Joe!